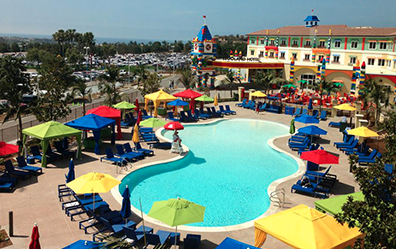 The all new Legoland Hotel opened this weekend in Carlsbad, California. We’ve been eagerly awaiting an invitation, or at least a report of what the pool is like! Brick shaped tiles? Stackable water toys? We wanna know! There is a pretty sweet water park in Legoland, so maybe the actual pool at the Legoland hotel doesn’t require anything special or Lego-themed? From this glance it looks like there are brightly colored umbrellas that echo the iconic bricks, but nothing else really Lego-fied. We were hoping it would be more along the lines of the Monorail Pool at the Disneyland Hotel. A giant min-fig slide maybe? If you stay here because you want to be close to the park, or because the hotel itself features some pretty cool brick work, then you’ll be happy regardless. Who really cares about the pool? Uh, us. If your’re in Carlsbad and you’re looking for a nice diversion from the park, with plenty of splash time opportunities and some super-pool features, you might want to check out the pool at La Costa instead. If you’ve been here, please give us a report! We’d still love to see it. And check out all of our San Diego area hotel pool reviews.